Speak Spanish - that should be your goal! How long have you been studying Spanish? Between high school classes, college classes and your own efforts you could easily have a couple years already under your belt. During that time you have likely built up a good Spanish vocabulary, a long with a basic understanding of Spanish verb conjugation. But can you speak Spanish? Why is speaking Spanish so hard? Can you go up to one of your Spanish speaking neighbors and start a conversation? Can you help a Spanish speaking customer who comes into your store? Why not? Why is it so hard to learn to speak Spanish even after years of study? Beginning high school and college Spanish classes, as well as most self study Spanish courses start off by teaching vocabulary and verb conjugation. You practice speaking, but the focus is on the individual word or phrase. Lists of words are memorized and tests are given on verb conjugation. So when it comes time to speak, the words and phrases are separate in your mind. It becomes a matter of trying to pull all the pieces together and form them all into a sensible sentence, not just speaking. The key to becoming more comfortable in speaking situations is to practice and learn the sentences as a whole, not in separate pieces. This way when you are trying to remember what to say you recall more than just a word - the whole sentence pops into your mind. You will speak Spanish more correctly, more fluently, and more confidently than ever before. 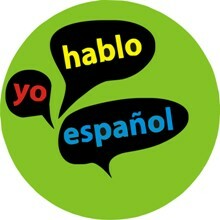 Here on this website you will find lessons that utilize this effective way of learning and practicing to speak Spanish. Go ahead and watch a free online lesson and then wait a few minutes to see what you remembered. You will see that as you recall what was taught, it will come into your mind as a complete sentence and not as separate words. You will already be on your way to speaking Spanish more fluently and more confidently.